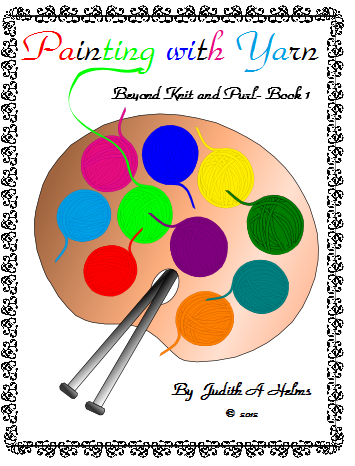 Today I just finished the first of a series of e-books focused on my adventures in color knitting. It has been a real challenge as well as a great joy to put together. My hope is that someone will get something out of it. If not, then perhaps some member of my family will be able to “pick” grandma’s brain when I’m gone. The 26 page book I am uploading for you is mostly focused on Intarsia, although I do have a section on knitting and purling with both hands. The information and illustrations in it are from my experience in developing my designer pillow patterns, which are intense color knitting; thus the title“Intarsiamania.” The book has two sections. The first deals with Intarsia basics; the second, focuses on yarn management. I hope you enjoy the book. I hope that some of the techniques will be helpful on your next color knitting project. I have been working on a tutorial that shares the method I used to knit this Intarsia design in the infants socks I recently completed for my new grand-daughter. One of the most important concepts I tried to illustrate in this method is learning to read the chart properly. I hope that I succeeded in explaining it clearly. If not, please feel free to contact me if you are interested. 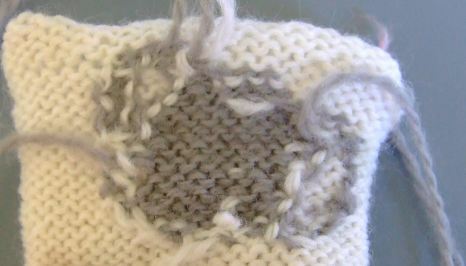 Below is a photo of the completed sample. The second photo is of the back of the design before I wove in the ends. 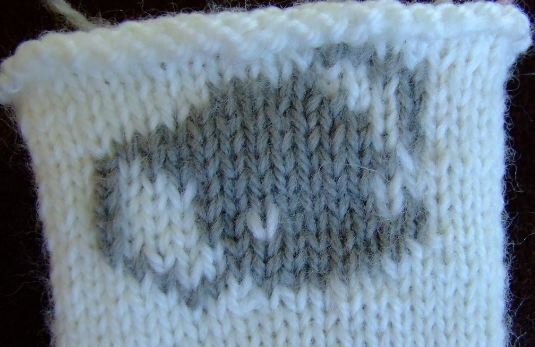 You can use this method to insert an Intarsia design in any project knitted in the round. There are no seams, with only a few exceptions all yarn connections are made at the color exchanges. 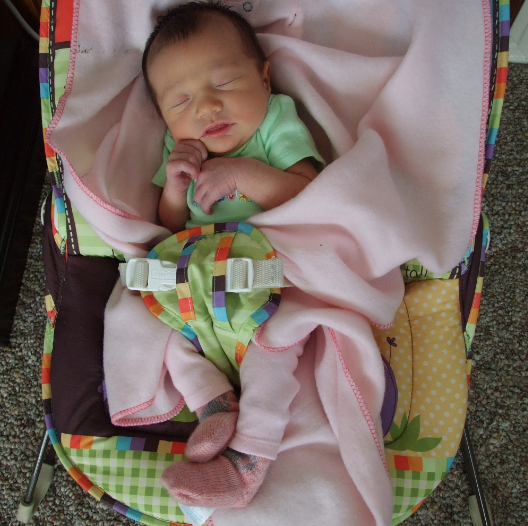 Well, the socks for Rebecca actually fit-not for long though. This tiny little 6+pound, 4 day old munchkin modeled grandma’s socks for the first time today. Good thing I didn’t make them any smaller.